Dion & The Belmonts were an American doo-wop group. Dion DiMucci, Fred Milano, Angelo D'Aleo and Carlo Mastrangelo all grew up in the Bronx, New York City, and sang together as teenagers in the 1950s. Milano, D'Aleo and Mastrangelo came together as a trio and named themselves The Belmonts, releasing a single on the newly formed Mohawk Records. DiMucci also recorded one single for the label as a solo act, so it wasn't long before they joined together, first as 'Dion with The Belmonts'. 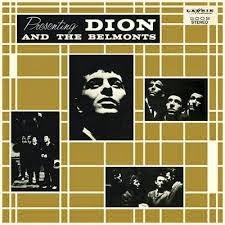 In 1958 they had moved to Laurie Records, and become Dion and The Belmonts. Their first single with Laurie was an instant hit. "I Wonder Why" charted nationally at #22, and led to an appearance on American Bandstand. This was followed by "No One Knows", charting at #19, "Don't Pity Me" at #40, and their first national tour, as they were rocketed to stardom as one of the best white doo-wop groups. 1959 saw them release their most enduring song - "A Teenager In Love", written by Doc Pomus and Mort Shuman, charted at #5 and is generally considered today one of the greatest pop songs of the original rock & roll era. It also charted at #28 in the UK. It wasn't actually their highest charting single though, that honour going to "Where Or When" (a remake of an old show tune), which reached #3 later in the year. Their debut album was released in 1959, featuring all of their hits. A brilliant collection of infectious doo-wop tunes, some of the best American pop music of the era.